(Nanowerk News) An international team of researchers has designed a new graphite-based, magnetic nano-material that acts as a semiconductor and could help material scientists create the next generation of electronic devices like microchips. 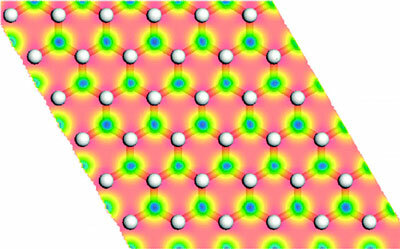 The team of researchers from Virginia Commonwealth University (VCU); Peking University in Beijing, China; the Chinese Academy of Science in Shanghai, China; and Tohoku University in Sedai, Japan; used theoretical computer modeling to design the new material they called graphone, which is derived from an existing material known as graphene. Graphene, created by scientists five years ago, is 200 times stronger than steel, its electrons are highly mobile and it has unique optical and transport properties. Some experts believe that graphene may be more versatile than carbon nanotubes, and the ability to make graphene magnetic adds to its potential for novel applications in spintronics. Spintronics is a process using electron spin to synthesize new devices for memory and data processing. Although graphene’s properties can be significantly modified by introducing defects and by saturating with hydrogen, it has been very difficult for scientists to manipulate the structure to make it magnetic. “The new material we are predicting – graphone – makes graphene magnetic simply by controlling the amount of hydrogen coverage – basically, how much hydrogen is put on graphene. It avoids previous difficulties associated with the synthesis of magnetic graphene,” said Puru Jena, Ph.D., distinguished professor in the VCU Department of Physics. “There are many possibilities for engineering new functional materials simply by changing their composition and structure. Our findings may guide researchers in the future to discover this material in the laboratory and to explore its potential technological applications,” said Jena. “One of the important impacts of this research is that semi-hydrogenation provides us a very unique way to tailor magnetism. The resulting ferromagnetic graphone sheet will have unprecedented possibilities for the applications of graphene-based materials,” said Qiang Sun, Ph.D., research associate professor with the VCU team. The study appeared online Aug. 31 in the journal Nano Letters ("Ferromagnetism in Semihydrogenated Graphene Sheet"), a publication of the American Chemical Society. The work was supported by a grant from the National Natural Science Foundation of China, The National Science Foundation and by the U.S. Department of Energy.